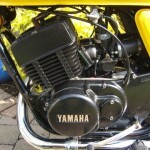 Restored 1978 Yamaha RD250 Motorcycle. Purchased as a project by its owner, this motorcycle was stripped down to the frame. 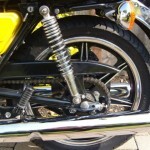 The swinging arm was powder-coated and fitted with new bearings. 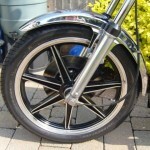 The wheels were sandblasted and painted & polished. The engine was stripped and inspected. The crankshaft was checked and found to be fine. The pistons and rings were cleaned and the engine was rebuilt with new seals and gaskets. The engine was tuned and balanced by an RD specialist. The front rear brake callipers were reconditioned as was the master cylinder. 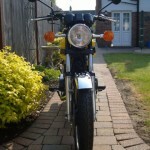 A very nice restored Yamaha RD250 Motorcycle. 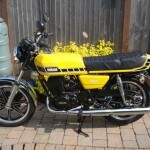 Yamaha RD250 – 1978 For Sale or Wanted? 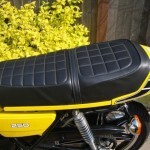 If you're looking for the perfect Yamaha RD250 – 1978 for sale then take a look at the hundreds of restored classic motorcycles listed on our extensive Motorcycles For Sale pages. 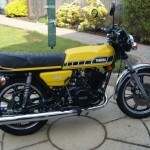 We regularly feature very nice restored Yamaha RD250 – 1978 bikes for sale. 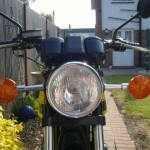 Spares and Parts for your Yamaha RD250 – 1978? 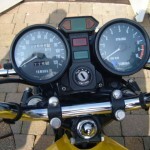 Workshop Manual for your Yamaha RD250 – 1978?